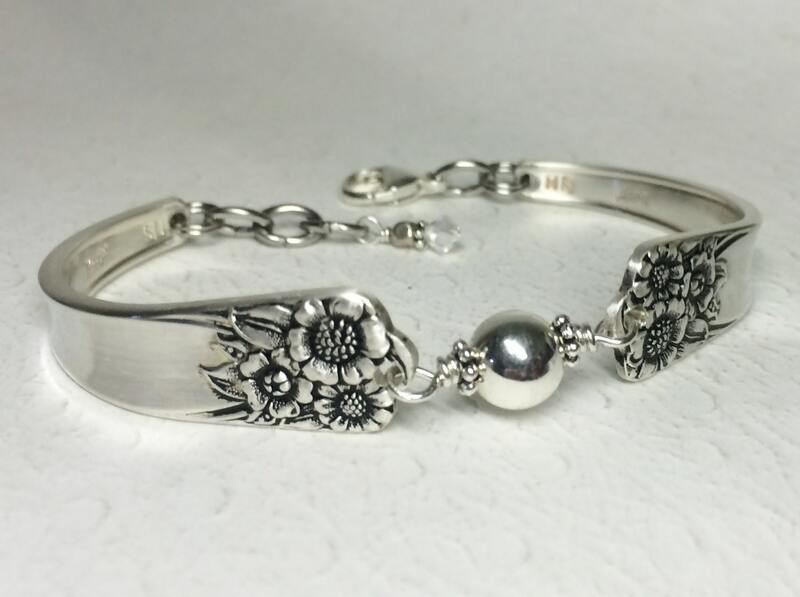 I created this sunflower spoon bracelet from two sterling plated teaspoons. The pattern is the ever popular "April" from 1950. 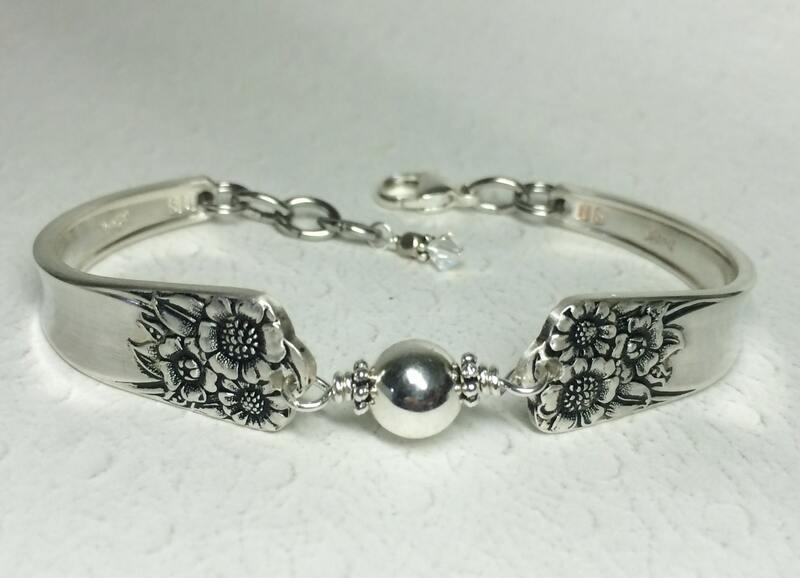 This bracelet is simply adorned with an 8mm sterling silver bead; nestled between antiqued daisy spacer beads, and twists of sterling silver wire. 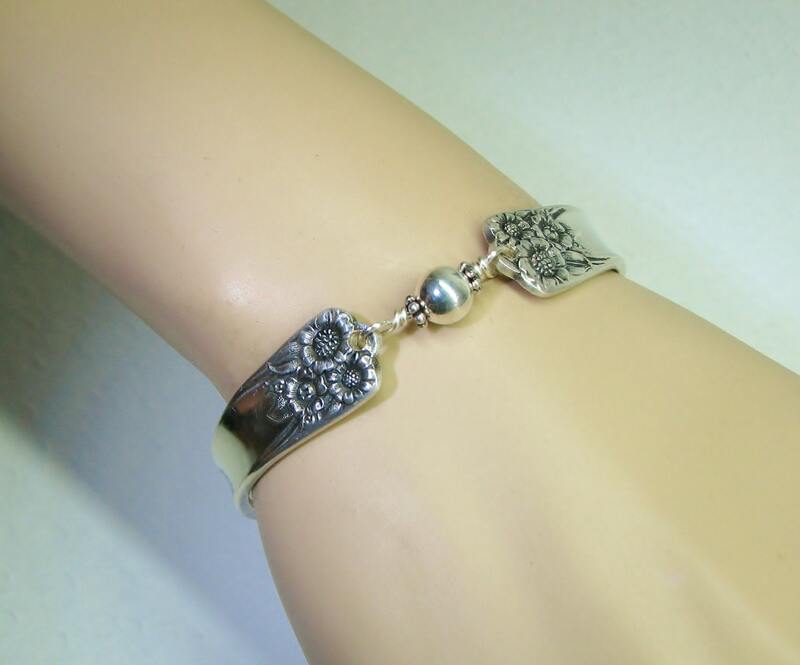 A happy, unique spoon bracelet that can be worn with virtually any outfit; day or night. The teaspoons in this pattern are also slender and offer a quite comfortable fit. 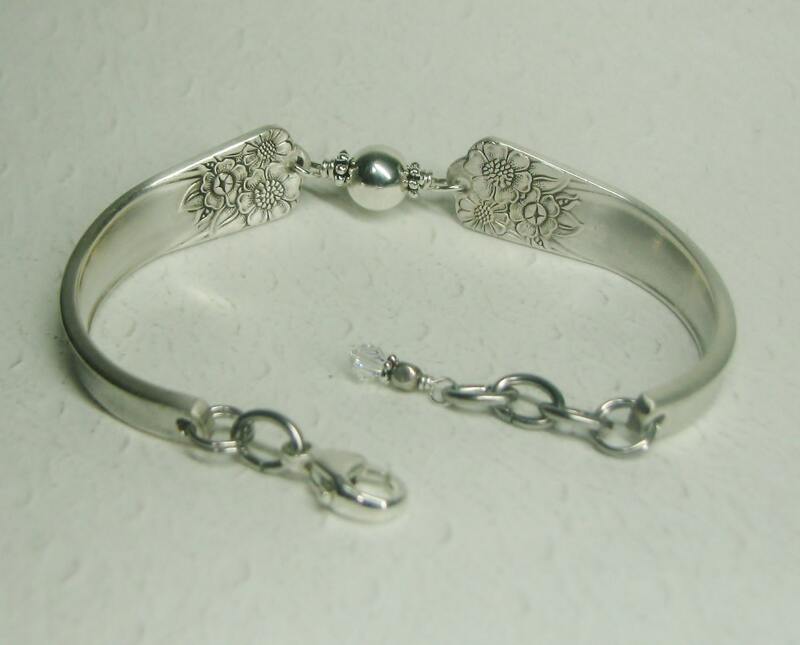 The spoon bracelet is finished with a nice sterling silver lobster clasp. There are also extra rings for a flexible fit, and they're topped off with a smaller sterling silver bead and crystal at the end. As is, this bracelet will fit a 6 1/2" to 7 1/4" wrist, so it will fit most wrists nicely. For a truly custom fit, you'll be asked at checkout to provide your actual wrist measurement (with nothing added) so I can fit your bracelet especially for you. If your wrist is smaller or larger than average, I'll create a custom bracelet for you. It will look just like the one in the picture, and still ship in 1-2 business days. No matter what size you are, you can have a great fitting spoon bracelet of your own. If it's a gift and you're not sure of the size, it will still be fine for most wrists within the average range. This cheerful piece of spoon jewelry will arrive in an equally festive organza gift pouch; along with a Spoonfest Jewelry story card, name & age the spoons, plus your bracelet helper tool. Gorgeous bracelet, beautiful packaging & the bracelet helper is such a nice added touch! Very fast service, too! Thank you! This is a beautiful item! Packaging was awesome. After receiving this, I ordered again, for myself. I will definitely be a repeat customer! Thank you! I love sunflowers and I love the uniqueness of jewelry made from silverware. This bracelet is so beautiful and well made that I wear it everyday with everything I wear. It is simple and elegant and brings a subtle bling to my wardrobe. The packaging was so impressive that if you sent it as a gift unseen you would have no worries and delivery was super fast. 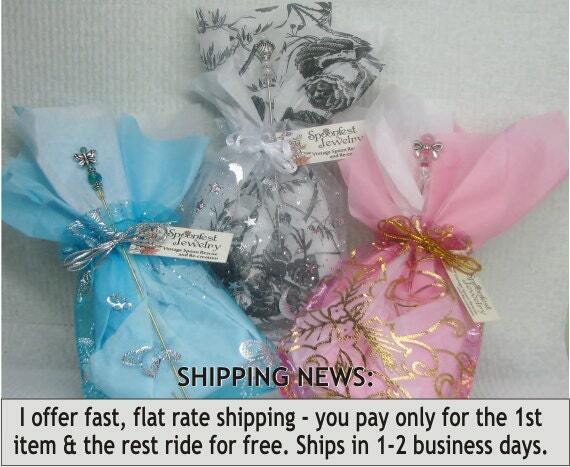 Fast shipping, well made, comes with nice packaging ready to give as a gift. Keep up the great work!